Clifton growers Jeff and Janet Lack have trialled different grain sorghums for 21 years now, but they keep returning to one variety that sees them through any season. The couple’s property Hunsingore is used as a testing ground each summer, pitting sorghum varieties against one another to determine their viability in one of Australia’s most productive cropping regions. Sorghum varieties such as MR-Buster, G33, and MR-Taurus were grown the previous summer, dedicating the majority of the dryland plant to their mainstay Buster and the rest to the other two for observation purposes. MR-Buster was planted on 120 hectares, G33 on 20 hectares and MR-Taurus on 10 hectares. MR-Buster has been grown by the Clifton croppers since its release in 1991, while the others had not been tried. Unfortunately, testing conditions were not ideal with two floods impacting the crops. 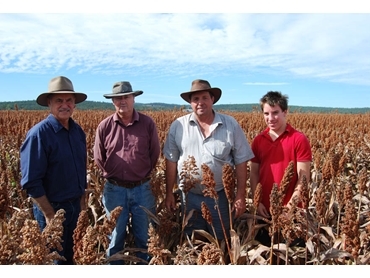 Mr Lack said the sorghum was planted in two stages - an early plant consisting of MR-Buster and G33 and a late plant consisting of MR-Buster and MR-Taurus. The early plant was hit with flood debris and the later January 5 plant was about 15 centimetres high when the flood went over it. Two thirds of the early crop was left completely underwater for two days while the late planted sorghum went completely underwater for between 1½ and 3 days. About 20 per cent of their early crop was lost to the flood and debris, which knocked it flat. The flood also left some lasting impacts, such as silt and dirt making the ground tough. According to Mr Lack, the flood tore the topsoil out of the sorghum and left them with hard ground. They had to go in and inter-row cultivate when the ground had dried out. Working at a slow speed, they were able to break up some raw ground, which actually gave the roots of the sorghum some dirt to hold up with. Mr Lack said MR-Taurus yielded approximately the same as MR-Buster but it never got a fair trial because of the rather extreme season. For the approaching summer season, the Lacks are talking about a slight change in plans. Going with a mainly sorghum-on-sorghum rotation again, they will be planting MR-Buster, MR-Taurus and MR-Scorpio this time. Mr Lack used tried and tested agronomic methods to extract the best from his crops. The grower planted on 90cm rows using a double disc, zero till Monosem planter at a seeding rate of 2.5kg/ha. He also used a post-plant pre-emergent spray of Gesaprim 900 at 2kg/ha and Dual Gold at 1.3L/ha for weed control. An in-crop spray using Starane Advanced at 450mL/ha and Gesaprim 900 at 1.2kg/ha was used to help control weeds. The sorghum was sprayed out before harvest to stop some of the weeds trying to come up from the floods. The early sorghum was harvested in late March/early April and the late sorghum was harvested in July after waiting for it to dry out. Mr Lack explains that he continues to plant the MR-Buster variety season after season as it is reliable in tough years as well as good years. He describes this variety as an all-rounder with the highest of yields on average. One of the easiest to harvest, MR-Buster has a very even height and a great size grain, and is good grain to sell.